This "antigravity relay" works great! It holds the heavy steel ball in place about 0.2 inches below the coil. The power supply draws about 500 mA to suport the ball, and you can see the current fluctuate slightly if the ball is swinging a little bit. There is a slight high-pitched whine from the coil, which is reduced if the "derivative" capacitor is increased. 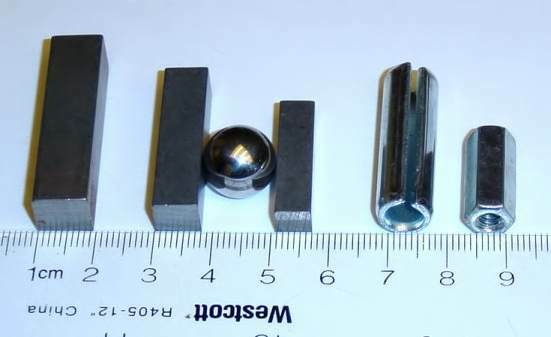 The ball can spin for a loooo-o-ng time, a great example of a magnetic bearing system. We painted lines on the (otherwise shiny) ball to make the rotation more visible. The lifting range is about half an inch. Don't expect it to pick up the ball from the bottom of the frame! The electromagnet can only reach out a few short centimeters, and anything further might as well be at infinity. Or in Colfax, Washington, same thing. You have to start by positioning the ball by hand each time. It takes a little practice to put it in place without your fingers interfering with the light beams. The lifting weight is almost an ounce (1/16 pound). Here is a photo of some objects I've suspended. The ball may swing a little from side to side. A bolt or iron bar may oscillate a little about its midpoint, and after some time (ten minutes or more) the oscillation can build up to where the bolt is dropped. This seems to be caused by the shape of our carriage bolt. The bolt's rounded head is pointing downwards, producing a wide field. A narrower field would hold the ball more steadily in one place. Next time (hah!?) I will put a more pointy end on the bottom of the electromagnet. What changes would make this work better? How can I improve this design? A reduced chip count can be achived by replacing the trusty but ancient 741 with a modern device. The modern parts have better specifications in all regards, and can be found in dual and quad packages. Alternatively, the first three op-amps can be replaced with an instrumentation amplifier, such as the Burr-Brown INA118 or Analog Devices AD620 or AMP02. Fewer power packs would make it smaller and cheaper. This can be done by using modern op-amps and eliminating the "ground" connection. This requires a redesign of several stages, but it would be easier to build. A small, dedicated power supply would make this project more portable. I'm using a industrial-strength lab bench supply that weighs forty pounds or more. Complete overkill. A simple circuit based on a few small three-terminal regulators should be adequate. Or, three plug-in battery eliminators have been found to work extremely well, with the advantage that no 110vac wiring is exposed. The sensor stages were designed backwards. It is counter-intuitive that the voltage will down as more light hits the sensor. It works just fine, but it doesn't make the most sense. It would be more understandable if the voltage goes up with more light. Then all you need is another level of voltage inversion somewhere, perhaps by changing the last amplifier from non-inverting to inverting design. You can make a linear output stage with a PWM chopper circuit. This allows linear analysis techniques to analyze the circuit performance. That is, if you compare the desired control signal with a sawtooth waveform, then the pulse width is proportional to the desired coil current. The article in Electronics Now (Feb 1996) shows the schematic of a safety cut-off circuit. It removes the coil's power if the ball is absent, or if the light beam is completely blocked. The idea (a very good one, too!) is to use the output from the difference amplifier. Since this signal is linear with respect to position, you can add low-voltage and high-voltage threshholds. If it exceeds either threshhold then the coil could be disabled with a smaller pass transistor. The only problem is the coil does get warm in a few minutes. It will be hot to the touch in half an hour. Sooner if no object is being held. I wouldn't want to leave it unattended! Note that a hollow steel ball would take much less power to levitate than the solid half-inch bearing that I used. Using a lighter ball would reduce average and maximum coil current requirements, which would greatly reduce the heat dissipation. However, this levitator is not stable with very lightweight objects and can't hold, for example, a thin-walled ball. My optodetectors are very wide-angle devices. They pick up a considerable amount of ambient light, even from inside a five-sided box. It would be helpful to use something to narrow their visible angle, such as an LED panel bezel mount. And it would be good to mount them as close together as possible. The output transistor (2N3055) runs with no noticeable heat generation. You can eliminate the heat sink, and the big 2N3055 could be replaced with a smaller TIP29 device. Or it could be replaced by a JFET device such as an IRF510. The smaller device can be mounted on the circuit board, which would simplify the mounting and wiring requirements. I used three-quarter inch thick pine wood (for shelving) to build the base and box. It would be lighter and easier to use thinner wood for construction. This is a great project that generates a lot of interest. Levitators are fun and yet rarely seen -- they just don't seem to exist on the retail market! This project would make a highly unusual science fair display, and illustrates the potential for maglev devices.